We remembered this thing we have called a blog. I’m not sure if anyone has missed us…but we are still here. I hope to start farm blogging again and occasionally, turn it over to my older boys to blog about the happenings at Vaughnshire Farm for those interested. I’ll briefly catch up this year…. The beginning of the year was full of cold weather, snow and ice and a bustling household still trying to adjust to having our 9th little one and an endless list of things to do on the farm. A huge accomplishment for Vaughnshire Farm is that we did not buy any firewood this past winter! The guys gathered and chopped all the firewood from our farm which kept the wood stove going for the winter months! A simple yet very exciting accomplishment. It’s harder than it sounds! In December, we restocked our freezers with beef and pork from our fields. January and February were lambing season, which always brings much needed excitement and expectation to the house during these frigid months. This year’s lambing season went off without a hitch…except for the time it didn’t and we stood outside in the below freezing weather and helped a momma sheep give birth. Twins…first one came out fine…the second one was stuck and needed to be pulled. We hate doing that! The first baby is healthy and growing fast. The second baby didn’t make it. 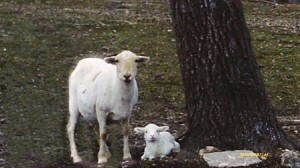 We had plenty of other sheep births that went perfectly. We had a lot of ewes this year compared to last year where we had a over abundance of rams. We also had our first ever twin ewe set! My young shepherd boy was happy over that. The Spring time came. It amazes me every year to see the sights and hear the sounds of spring here. It’s a beautiful place. The variety of plants and wildlife are enormous. Each with their own beauty and character that reflect their Maker’s ingenious design. Spring time brings lots of rain. This year brought lots of rain as expected and bad storms and flooding but not near as bad as last year. While we still have much work to do on the farm to repair the damage from last year’s flood. It’s been one year since the great floods here in our area. 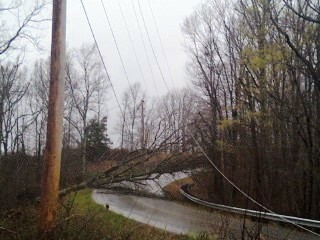 Thankfully, our electricity was only out for 1 day this time. 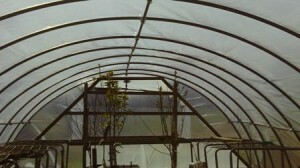 Our biggest accomplishment so far this year is that the boys were able to get the greenhouse up and running. We still have minor tweaks to finish it off, but it is functioning quite well. We grew a variety of plants and herbs for our garden. Not all will fit in our garden..so I imagine we will give some away and plant in various other places around the farm. Another big accomplishment is that we started our strawberry raised beds. We have strawberries growing and all are very excited about the up and coming berries this year. I’m awe struck when I consider the men and women of past generations and their amazing ability to grow a large amount of food for their family from their own gardens. Last year our garden was practically non-existent due to me being pregnant. This year, it’s a struggle to get the garden up and going due to enormous responsibilities and activities. We’re trying to make the garden our first priority so that we hopefully can reap a harvest of fruits and vegetables this summer. Good to hear from you! I was just thinking about your family this morning~ isn’t God good to connect people even over a computer? :)) Glad things are going well with your family and on your farm, even if it is busy. Terri… I had no idea what your family has been going through until I just check out your blog after you commented. My heart is breaking for you and your family but resting in the hope we have in Christ. Our prayers and thoughts are with you as you continue to lift your eyes up to Christ where our strength and help comes from. Stand Strong!